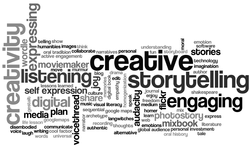 How do you create a digital story? What kind of story best suits the sort of project you’re working on? For example, is your story about a great artist or scientist or more a story of struggle or discovery? Is your self-portrait, family history, or presentation about a famous person in history a character story? Do you want to present your research on war victims as a memorial story? Do you want to present what you learned about an environmental issue or period of history as a story about a particular place? Is the novel you are transforming into a digital story an adventure story? Some stories start with a dramatic question, others with a shocking statistic or image. Find a way to grab your audience’s interest right away, and then keep them expecting more. Raise more questions or suspense along the way. Telling a story is not pouring facts into empty heads; it’s a way of persuading others to see something about the world as you have understood it. All parts of the story should contribute to this point of view. Also, do enough research about your subject so that you are an expert and are entitled to your unique, informed point of view. 5. Use fresh and vivid language. Even digital stories have to use words. Don’t let the words take a back seat to the power of the images and sounds. Be clear, be specific, and use metaphors and similes to help your audience understand at deeper levels. 6. Integrate emotion – yours and the audience’s. Every story has a tone or emotional feel that affects the audience. Figure out what yours is, and make sure the words, images, and sounds you choose all enhance that tone. 7. Use your own voice, in the script and in the audio. Much of the power of stories comes from the distinctiveness of the voice that tells them. Good storytelling goes beyond an objective, distant, or impartial voice to a voice that is engaged and, therefore, engaging. When you write the script, write it in your style of speaking. When you record your script or voiceovers, be yourself. 8. Choose your images and sounds carefully. Each image, each sound or piece of music, and each combination evokes a different response in your audience. When editing, make sure that each image and sound does exactly what you want it to do to further your story. Make sure that you use images in a nonliteral way; don’t just choose an image to illustrate your words, ideas, or tone, but use images that comment on them, expand them, or interact with them in some way. For a good example of how to use images, watch True America, a YouTube video by a high-school student. 9. Be as brief as you can be. Longer doesn’t mean better in digital storytelling. The challenge is to create a moving story that will affect your audience so powerfully that they will remember it. Don’t try to tell everything. Select only the details or events that will sharpen the story and keep it moving. This allows the audience to actively participate by filling in the gaps. 10. Make sure your story has a good rhythm. Rhythm is the heart of all stories. If a story isn’t moving, it’s boring. If it goes too fast, it leaves the audience behind. Know how to establish the right pace for your story (a memorial might be slower, an adventure story faster) and know when to slow down and speed up the established pace to keep the audience interested. You can change the pace with music tempo, image duration, speech rate, silence, panning, zooming, and many other techniques.